All in as a card carrying member of the MAGA cult. ….In fact, Mr. Trump didn’t inherit a fixer-upper economy. 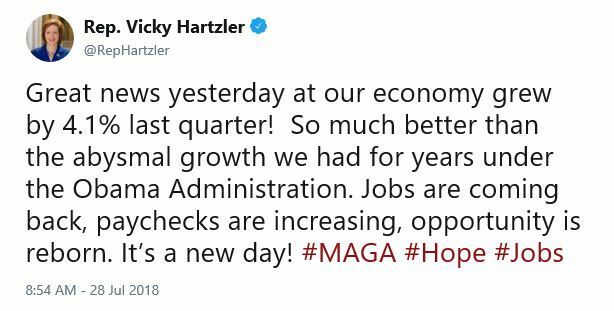 While Mr. Trump praised the 4.1 percent annual growth rate in the second quarter, the economy exceeded that level four times during the Obama presidency: in 2009, 2011 and twice in 2014. In purely numerical terms, a larger shift took place in the second quarter of 2014, when the economy went from contracting by 1 percent to growing at a rate of 5.1 percent…. No, it’s not a new day. Actually Vicky, in the 2nd quarter of 2014, the GDP grew by 5.1%. We deserve a Rep who is familiar with the history of their own nation at least going back 9 years or so. You are part of the problem, Vicky. Why does good news on the economy always have to be contrasted with the Obama administration? Oh, because the Liar in Chief says so in his hateful insecurity. 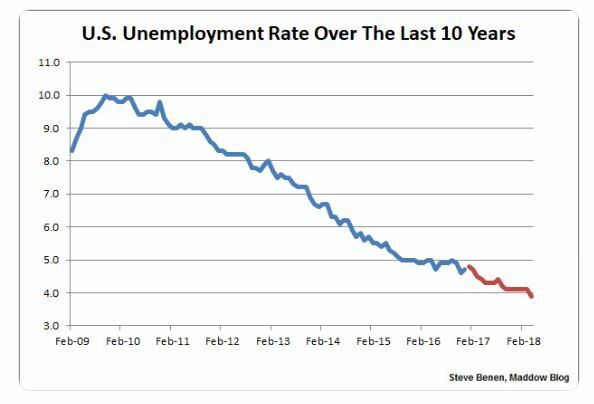 Btw, the Obama years hit 5% from time to time. Each lie gets a little easier, huh Vicky. Literally everything you said after that first sentence was false. Uhmmm….we hit 5% several times under the Obama administration. No need to lie to get your point across. Wages are not increasing and growth hit at least 4% several times in the Obama years. You consistently lie to suit your far right worldview and I’m embarrassed that you’re my rep in Congress. Stop trying to sell tax cuts for the rich as something good for average Americans. The Chicago Times said that inflation increased slightly. The number of homeless grew in 2017 for the first time in a decade. Don’t worry. All these things are completely natural business fluctuations. But who cares about him being a Russian puppet, immigrant children still not with their parents, and 3D printed plastic guns coming soon. You sicken me. I know the truth is hard for you, but maybe you should try lying about something this isn’t so easy to fact check. Another lie from Missouri’s 4th district mouth piece. You could care less about the dismantling of our country! Sad-shame-pathetic! You know this is a blatant lie, right? Is that the new playbook for the @GOP just lie and hope people are too dumb? That appears to be their plan. The release of this final tax reform bill brings hard-working Missouri families one step closer to relief. I look forward to voting on the tax package next week and getting it to President Trump’s desk before Christmas, so that Americans will see their paychecks increase and more jobs come back from overseas. The Tax bill will bring relief to “hard-working” Missouri families: I suppose this is true insofar as it’s possible that some billionaires are hardworking. And these guys are going to have so much relief that they will, to paraphrase Trump, who will also make out like the proverbial bandit, get sick of being relieved. Others, we are told by tax experts who have reviewed the document, may or may not pay less and, of course, even these much smaller poor folks “cuts” will expire within 5-10 years. Many working and middle class families and some small businesses will pay more in taxes right away since crucial deductions have been “simplified” out of existence in order to pay for huge, permanent cuts for corporations – which will, incidentally, keep almost all of the loopholes that the elimination of which have in the past provided a rationale for lowering the corporate tax rate. Americans will see their paychecks increase: Most economists agree with those who assert that if it hasn’t already happened, increasing the corporate bottom line via a huge tax cut isn’t going to make it happen. As The Washington Post notes, “wage growth has remained relatively sluggish over the past several years, even as corporate profits hover near all-time highs as a share of the economy, and the unemployment rate continues to fall to levels that economists normally associate with rapid increases in worker pay.” Expect the corporate tax windfalls to go straight into corporate stock buybacks and to wealthy stockholders. Americans will see … more jobs come back from overseas. The tax scam bill would allow companies to repatriate profits on a one-time basis at a 15% rate, a strategy that has failed to stop offshoring in the past. Tax lawyer David Herzog reminds us in a New York Times op-ed that, “by instituting a tax holiday in 2004, the government signaled to companies that future untaxed profits could eventually be repatriated when the budget was in trouble.” That’s why corporations are now sitting on $2.5 billion dollars they’ve squirreled away in foreign countries, waiting on the next tax holiday – and, voila, here it is.Thank you Daddy Trump. Nevertheless, we can expect this disastrous, deficit busting bill to pass with unanimous Republican support today. Its passage will happen even though a majority of Americans, even those who will get a tax cut, have made it clear in polls that they know it stinks. If you are interested in why Republicans don’t care about their constituents needs and preferences, Steve Benen has done an excellent job of outlining the possible reasons for GOP disregard of public opinion in this case. 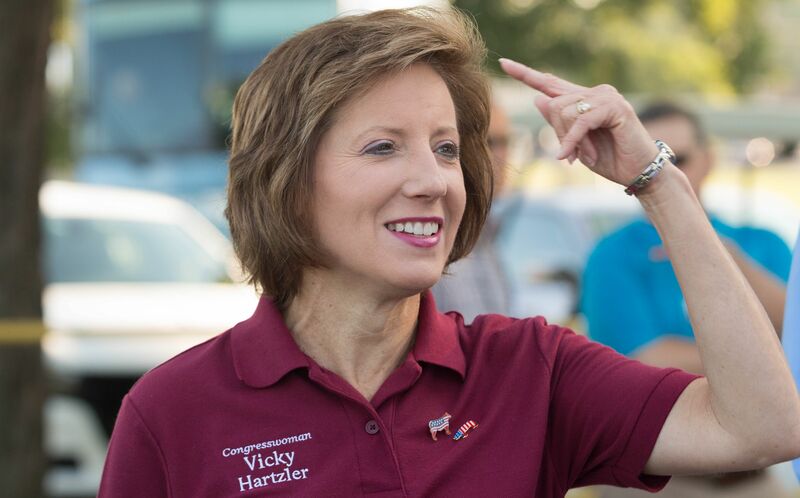 I personally think that Rep. Hartzler’s mendacity in trying to pass off a mess of spoiled pottage as caviar and champagne can give us a clue to at least one aspect of the GOP strategy. I expect that we’ll hear many variants of Hatzler’s fantastic stories tripping off the lips of our imaginative Republican congresspeople in the coming weeks.They’re so sure that the voters they need have been Foxized to the point that they can be told up is down and they’ll not only believe it, but will start walking on their hands. Republicans think we’re dumb, manipulable bozos who can be led by our noses straight off a cliff. And maybe they’re right to be contemptuous of their voters. Just look at who is sitting in the White House. It was accompanied by an illustration with a representation of a New York Times with a byline for Bunyamin [sic] Applebaum, a cup of coffee, a desk top computer (and assorted paraphernalia), and (maybe) some sort of tablet device on a table top off some sort. Uh, if someone has a tablet, a desktop computer, and a cup of coffee at a desk do you think they’ll be reading an analog version of the newspaper at the same desk? Or would they probably access it on line? Just asking. Well, yes there is a Binyamin Appelbaum who is a reporter at the New York Times. And the article was actually dated June 11, 2014. Uh, that was a month ago. 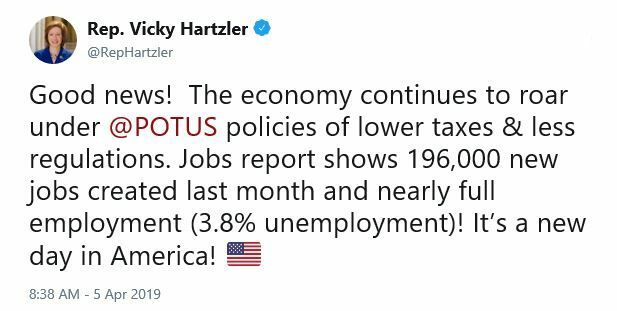 Maybe Representative Hartzler (r) still uses dial-up on a 1200 baud modem. Think about that for a second. Representative Hartzler (r) is utilizing a month old article in the New York Times to assist her in spinning criticism of the current state of the economy, while missing the photo caption in the same article which indicates that a probable contributor to that problem is the implementation of her party’s obstructionist ideology in Congress. Sweet. 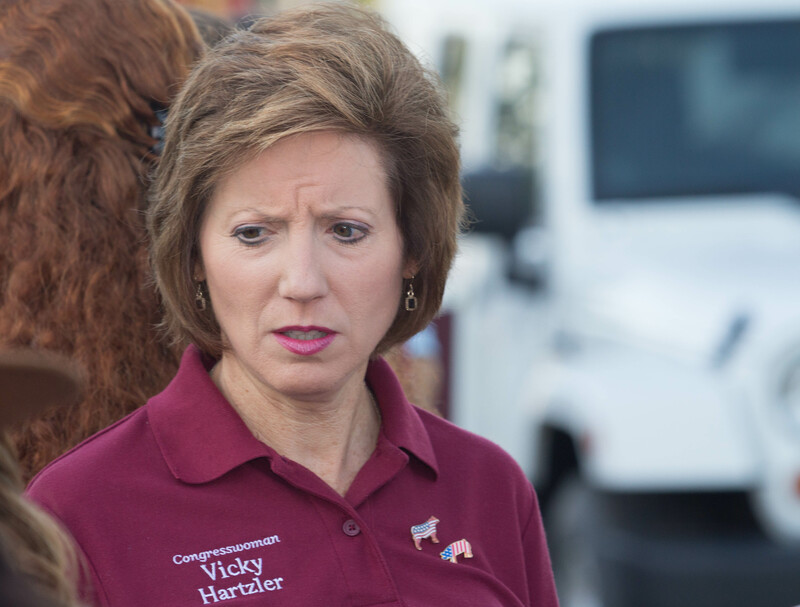 Rep. Vicky Hartzler (r): Two years ago I couldn’t spell economist, now I are one. Today’s GDP Number Is Not as Bad as it Sounds. But the Recovery Is Still Weak. ….But this may be a case of bad news that’s not so bad-and maybe even good. The reason why consumer spending fell is that health care spending decreased by 1.4 percent in the first quarter. In fact, in the BEA’s second estimate, health care spending contributed 1.01 percent to the growth rate. Under the third estimate, it subtracted 0.16 percent. In other words, health care spending went from a strong contributor to GDP growth to a detractor from it-all in a quarter when millions of Americans gained health insurance…. And who keeps voting to repeal Obamacare? Just asking. This wasn’t an “average” recession. …. 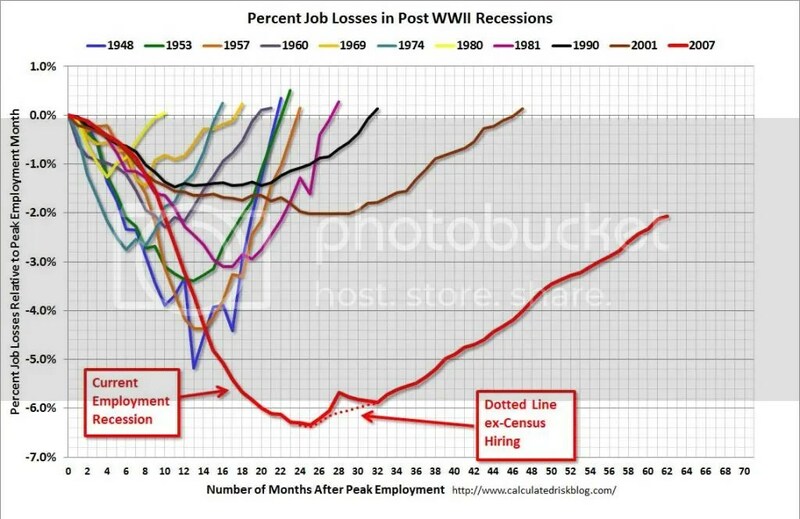 [The] graph shows the job losses from the start of the employment recession, in percentage terms, compared to previous post WWII recessions. The dotted line is ex-Census hiring. This shows the depth of the recent employment recession – worse than any other post-war recession – and the relatively slow recovery due to the lingering effects of the housing bust and financial crisis…. ….The number of long-term unemployed (those jobless for 27 weeks or more) was little changed…. ….The civilian labor force participation rate declined by 0.2 percentage point to 63.6 percent in November, offsetting an increase of the same amount in October. Total employment was about unchanged in November, following a combined increase of 1.3 million over the prior 2 months. The employment-population ratio, at 58.7 percent, changed little in November…. ….The number of persons employed part time for economic reasons (sometimes referred to as involuntary part-time workers), at 8.2 million in November, was little changed over the month…. ….In November, 2.5 million persons were marginally attached to the labor force, essentially unchanged from a year earlier…. ….Among the marginally attached, there were 979,000 discouraged workers in November, little changed from a year earlier…. Uh, that’s a significant improvement in four months despite republican obstructionism in Congress. President Obama (D): Thank you, everybody. Thank you. [applause, cheers] Thank you very much. Thank you so much. Thank you. [applause] Thank you very much, everybody. Everybody, please have a seat. [applause] Thank you. Well, good afternoon, everybody. [voices: “Good afternoon.”][laughter] Now that, uh, those of us on the campaign trail have had a chance to get a little sleep [laughter], uh, it’s time to get back to work. And there is plenty of work to do. As I said on Tuesday night, the American people voted for action, not politics as usual. You elected us to focus on your jobs, not ours. And in that spirit, I’ve invited leaders of both parties to the White House next week so we can start to build consensus around the challenges that we can only solve together. And I also intend to bring in business and labor and civic leaders from all across the country here to Washington, uh, to get their ideas and input as well. You know, at a time when our economy is still recovering from the great recession our top priority has to be jobs and growth. That’s the focus [applause] of the plan I talked about during the campaign. It’s a plan to reward small businesses and manufacturers that create jobs here not overseas. It’s a plan to give people the chance to get the education and training that businesses are looking for right now. It’s a plan to make sure this country is a global leader in research and technology and clean energy, which will attract new companies and high wage jobs to America. It’s a plan to put folks back to work, including our veterans, rebuilding our roads and our bridges, and other infrastructure. And it’s a plan to reduce our deficit in a balanced and responsible way. Our work is made that much more urgent because at the end of this year we face a series of deadlines that require us to make major decisions about how to pay our deficit down, decisions that will have a huge impact on the economy and the middle class, both now and in the future. Last year, I worked with Democrats and Republicans to cut a trillion dollars worth of spending that we just couldn’t afford. I intend to work with both parties to do more, and that includes making reforms that will bring down the cost of health care so we can strengthen programs like Medicaid and Medicare for the long haul. But as I’ve said before, we can’t just cut our way to prosperity. If we’re serious about reducing the deficit we have to combine spending cuts with revenue, and that means asking the wealthiest Americans to pay a little more in taxes. [applause] That’s how we did it. That’s how we did it in the nineteen-nineties when Bill Clinton was President. That’s how we can reduce the deficit while still making the investments we need to build a strong middle class and a strong economy. That’s the only way we can still afford to train our workers, or help our kids pay for college, or make sure that good jobs in clean energy or high tech manufacturing don’t end up in countries like China. Now, already, I’ve put forward a detailed plan that allows us to make these investments while reducing our deficit by four trillion dollars over the next decade. I want to be clear, I’m not wedded to every detail of my plan. I’m open to compromise. I’m open to new ideas. I’m committed to solving our fiscal challenges. But I refuse to accept any approach that isn’t balanced. I am not going to ask students and seniors and middle class families to pay down the entire deficit while people like me, making over two hundred and fifty thousand dollars, aren’t asked to pay a dime more in taxes. [applause] I’m not going to do that. And I just want to point out this was a central question during the election. It was debated over and over again. And on Tuesday night we found out that the majority of Americans agree with my approach and that includes Democrats, independents, and a lot of Republicans across the country, as well as independent economists and budget experts. That’s how you reduce the deficit, with a balanced approach. So our job now is to get a majority in Congress to reflect the will of the American people. And I believe we can get that majority. I was encouraged to hear Speaker Boehner agree that tax revenue has to be part of this equation, so I look forward to hearing his ideas when I see him next week. And let me make one final point that every American needs to hear. Right now, if Congress fails to come to an agreement on an overall deficit reduction package by the end of the year, everybody’s taxes will automatically go up on January first, everybody’s, including the ninety-eight percent of Americans who make less than two hundred and fifty thousand dollars a year. And that makes no sense. It would be bad for the economy and would hit families that are already struggling to make ends meet. Now, fortunately, we shouldn’t need long negotiations or drama to solve that part of the problem. While there may be disagreement in Congress over whether or not to raise taxes on folks making over two hundred and fifty thousand dollars a year, nobody, not Republicans, not Democrats, want taxes to go up for folks making under two hundred and fifty thousand dollars a year. So let’s not wait. Even as we’re negotiating a broader deficit reduction package let’s extend the middle class tax cuts right now. [applause] Let’s do that right now. That one step, that one step, would give millions of families, ninety-eight percent of Americans and ninety-seven percent of small businesses, the certainty that they need going into the new year. It would immediately take a huge chunk of the economic uncertainty off the table,and that will lead to new jobs and faster growth. Business will know that consumers, they’re not going to see a big tax increase. They’ll know that most small businesses won’t see a tax increase. And so, a lot of the uncertainty that you’re reading about, that will be removed. In fact, the Senate has already passed a bill doing exactly this, so all we need is action from the House. And I’ve got the pen ready to sign the bill right away. [applause] I’m ready to do it. I’m ready to do it. You know, the American people understand that we’re going to have differences and disagreements in the months to come. They get that. But on Tuesday they said loud and clear that they won’t tolerate dysfunction, they won’t tolerate politicians who view compromise as a dirty word, not when so many Americans are still out of work, not when so many families and small business owners are still struggling to pay the bills. What the American people are looking for is cooperation, they’re looking for consensus, they’re looking for common sense, most of all, they want action. I intend to deliver for them in my second term, and I expect to find willing partners in both parties to make that happen. So let’s get to work. Speaker John Boehner’s (r) idea is to implement Mitt Romney’s plan (as vague as that was/is). Oh, wait, elections have consequences you say?